Welcome students, prospective students, parents and teachers to the website of the Louisiana State University Mathematics Department undergraduate program. The LSU Department of Mathematics strives to provide an excellent education for our undergraduate students. We strive to provide students with the skills needed to face the marketplace or to enter further studies in graduate school. We offer a broad and diverse program in both applied and pure mathematics, with a choice of six concentrations. The Undergraduate Menu in the left side-bar leads to the many features of this site. The mathematics department is a large and active department. In addition to our undergraduate program, we have 52 professors engaged in mathematical research and 90 graduate students engaged in advanced study. The diverse ecology of mathematics makes the LSU mathematics department an exciting place to be. The LSU Mathematics Department prepares mathematics majors for industry, teaching, or seeking an advanced degree in graduate studies. The mathematics curriculum contains a choice of six concentrations--mathematics, actuarial science, applied/discrete mathematics, mathematical statistics, secondary education, and (beginning in the fall of 2012) computational mathematics. After completing the Calculus sequence, students are ushered into higher level mathematics by taking two of three possible transition courses: Solving Discrete Problems (Math 2020), Integral Transforms and Their Applications (Math 2025), or Discrete Dynamical Systems (Math 2030). Junior and senior level classes are designed to serve students according to the concentration selected and usually have enrollments of less than 25, fostering individual attention. 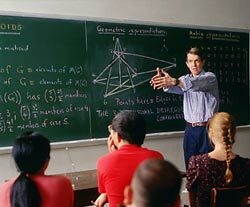 The Mathematics Concentration offers a solid background in mathematics. It is the concentration that allows the most freedom to pursue mathematical depth or a broad background in liberal arts. Those who wish to pursue graduate study in mathematics, or one of the professional schools, should consider this concentration. The Actuarial Science Concentration prepares a student to become an actuary. An actuary studies future risks in finance, business and insurance. The job of actuary consistently ranks as one of the best in the US. Actuaries must learn mathematics, economics, and finance. The Concentration in a Second Discipline provides students a customizec route to preparing for using mathematics in a specific discipline, be it physics, biology, computer science, engineering, economics or other. The Mathematical Statistics Concentration is versatile enough to prepare students to enter into graduate programs in statistics or directly into employment. Students may emphasize mathematical analysis, probability, and some practical statistics courses to prepare for graduate school in statistics or they may put more emphasis on practical statistics for employment. The program was formed in cooperation with the Department of Experimental Statistics. A student may obtain a minor in Experimental Statistics by taking a proper choice of required electives and one additional class. The Secondary Education Concentration prepares students to become middle or high school mathematics teachers. Graduates will have the mathematical background of a bachelor’s degree in mathematics, the education background with teaching certification, and classroom experience. The LSU GeauxTeach program offers more information to students pursuing this concentration. The Computational Mathematics Concentration offers course work in the mathematics behind numerical procedures and computer algorithms. It is recommended for students interested in careers grappling with tomorrow's large-scale numerical problems. For a list of the courses required by each concentration, click on "Degree Requirements" in the "Undergraduate" menu. Our undergraduate program also offers opportunities to engage in education and service beyond classroom courses. Our Mathematics Consultation Clinic gives students experience working with local businesses and industry. Participating in the clinic gives credit for capstone requirement. In the summer, the mathematics department runs an excellent REU—research experiences for undergraduates. The math club sponsors mathematical talks designed for undergraduates. In our school outreach program, undergraduate volunteers tutor individuals or small group classes in local high schools. We are glad you are interested in mathematics and LSU. Please browse through the website. There is information on Baton Rouge, the mathematical interests of the LSU Math faculty, the Department of Mathematics, the interests and activities of our mathematics majors, and majoring or minoring in mathematics. Last updated January 6, 2012.